Bad Fortune Cookie: Is It Smart To Eat Something, When You Don't Even Know What It Is? I didn't even notice the shoes on the counter. And um... yeah. That's some seriously scary fruit. If I see any at Whole Foods tonight I'll let you know. You are a much better mom than me. I threw up a little bit in my mouth just looking at that second picture. Hell to the NO, NO, NO, I wouldn't have tried that. I bow to your great mommy-ness. I don't know what cuttlefish is but if octopus is a substitute... ain't eatin' that either. I have no sense of adventure where food is concerned. I would love to know what the scary, spikey, slimy fruit really is though. I bet my nieces and nephew would try it. Google didn't help me out on your strange fruit, but let us know when you figure it out. I remember taking raisin pie to school when I was about 8 and convincing a classmate that it was "fly pie". Yea for weird stuff! And yea for S.'s adventurous appetite! Argh! Looks to me like a Rambutan. They're from SE Asia and I love them. But they are funky-looking, so here's to you (and Shecky!) for trying something so weird! 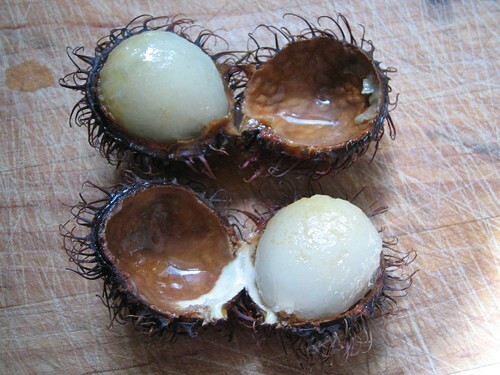 I'm 1/2 Vietnamese and we used to eat a litchis all the time. The ones we had were reddish or brown on the outside and more spikey, but the inside looks the same. Wow, what an interesting shopping trip! Good for you for being brave, so very brave. I would have probably tried it, but in the privacy of my own home so that I could hurl if need be. Ok so my first thought was Oh Publix! I miss Publix! Then I thought maybe it was a Lychee fruit of some kind. I was close they come from the same area of the world. They would be awesome for a Halloween party! When I was in 6th grade my mom did a really cool Halloween party for me & we played pass the body parts, you have bowls of “body parts” you stick your hand in while mom was reading a story about the parts. You know peeled grapes for eyeballs, pasta for worms, etc etc. I bet the kids at school will think that you are the coolest mom ever! wow. that was some kind of ugly inside there. and you still ate it? kudos to you. i might have done that. maybe. so it was grapey tasting? kindly looks like one of those things i find one the ground. a chestnut? genetically modified chestnut? can't wait to learn what it is. It is a rambutan, which is like a lychee, except "hairier". The inside is very sweet and kinda chewy like a peeled grape. Just don't eat the seed. AAAAAAAHHHH! You are a brave mommma! I am a food wimp. Hell to the no still has me laughing. I'm going to be saying that all week now. heh. 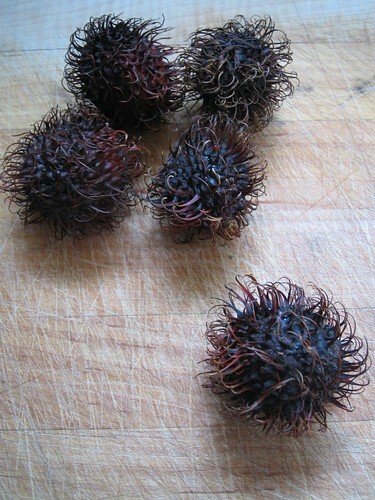 yellojkt is correct, this is called rambutan and is as common as apples in southeast asia. It really is good to try new things. 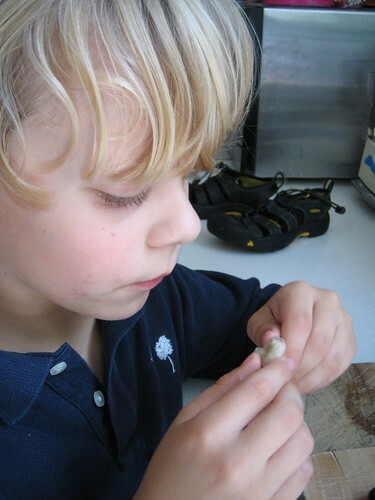 Your son is smart (and brave :)) cookie.